Draft: 2007, Chicago Cubs, 4th rd. Darwin James Kunane Barney…resides in Beaverton, OR with his wife, Lindsey, and daughters, Hayden, Zoey, and Devyn…attended Oregon State University…was named to the All-Tournament team after homering and driving in two runs to help the Beavers clinch their second-consecutive College World Series title in 2007…named All-Pac-10 First Team and the Pac-10 Freshman of the Year in 2005…selected to Team USA by USA Baseball in 2006, where his team won a gold medal at the World University Games…also named All-Pac-10 First Team…graduated from Southbridge (Ore.) High School in 2004…led the school to its first-ever baseball state championship in 2003…selected by the Cubs in the fourth round of the 2007 First-Year Player Draft out of Oregon State University. In 2nd full season with Toronto, batted .232/.275/.327/.602 in 362 PA's and 129 games…most games since 2013 (141)…went 7-for-9 in steal attempts, 2nd-highest SB total of his career (9 in 2011)…made starts at 2B (58), 3B (32), SS (5), and LF (1)…his .992 (2 E/255 TC) fielding pct. at 2nd base ranked 3rd in MLB (min. 500 inn.) to only BOS' Dustin Pedroia (.995) and MIN's Brian Dozier (.993)…went 3-for-16 as a pinch-hitter… batted .319 (23-72) in 1st 30 G thru 5/12, then hit .176 (35-199) in 76 G from 5/13-9/1 to drop season avg. to .214…beginning 9/2, had a .308 (20-65) figure in final 23 G to finish at .232…matched career high with 4 hits (4th instance) on 9/10 vs. DET and had pair of 3-hit games…season-best 8-G hit streak from 7/23-8/5…had re-signed with Jays in January 2017. Made his professional debut as an outfield (LF) July 20 at ARI, recording two putouts…Notched 3+ RBI for the first time since July 14, 2013 vs. Cardinals (with Cubs)...Made his professional debut as a pitcher in the 19th inning, July 1 vs. CLE, becoming the 10th different position player to pitch in a game for the club (14th time)…Suffered the loss (1.0, H, K) after surrendering a leadoff HR to Carlos Santana…Is the only position player to pitch in a game for TOR & pick up a losing decision...Recorded three consecutive multi-hit games from June 5-7 (6-for-10). Acquired from the Dodgers on Sept. 13 for a player to be named later (Jack Murphy). Sept. 30 at Baltimore hit his first home run of the season, and his first since Sept. 17, 2014 at Colorado. Sept. 23 vs. Yankees he collected his first hit with Toronto; a single in the second inning… Was his first hit in the major leagues since Sept. 28, 2014 vs. Colorado. Spent the majority of the season with Oklahoma City of the Pacific Coast League (AAA), starting 57 games at second base, 17 at shortstop and 13 at third base. Appeared in just two April contests for the Dodgers before being optioned on April 14. Darwin led Major League second basemen with a .993 fielding percentage (4 E/603 TC), and batted .208 (104-for-501) with a career-high tying seven home runs and 41 RBI in 141 games with Chicago... Began the year with a 71-game errorless streak at second base and finished it with a 52-game errorless streak... Ranked second among National League second basemen in defensive WAR (1.4) and made only four errors, the fewest by any everyday second baseman... Ranked fourth in the N.L. with 603 total chances at second base … ranked fifth in the Senior Circuit with 363 assists... Recognized as the Cubs 2013 Wilson Defensive Player of the Year Award winner ... one player from each club is recognized... Played 141 games at second base, making 139 starts... Was the sixth-hardest player to strike out in the N.L., fanning once every 8.7 plate appearances... Grounded into 22 double plays, most on the club and fifth in the National League... Hit .246 (32-for-130) against left-handed pitchers compared to a .194 mark (72-for-371) against righties... Hit .225 (53-for-236) at home compared to a .192 mark (51-for-265) on the road... Set a career high with 36 walks (5 IBB)... Ranked third on the club in games (141) and at-bats (501), fourth in runs (49) and doubles (25), tied for fourth in hits (104) and fifth in RBI (41)... Batted .265 (9-for-34) in seven games out of the lead-off spot in the order... His .255 June batting average (27-for-106) was the highest of any month... Began the season on the 15-day disabled list with a deep laceration on his left knee, suffered in an exhibition game, March 30 at Houston... Went on an injury rehabilitation assignment with Triple-A Iowa, April 13, batting .500 (5-for-10) with three walks, a double, four runs scored and a stolen base in three contests … activated from the disabled list, April 16... Belted a game-winning, solo homer in the top of the 10th inning, April 23 at Cincinnati... Tied a career high with two doubles, April 29 vs. San Diego... Tied his career high with four hits, May 21 at Pittsburgh … finished 4-for-4 with a triple, two runs scored and a go-ahead RBI... Committed fielding errors in consecutive games, July 7-8, after going 74-straight games at second base without an error September 30, 2012-July 6 - committed his first error of the season in July 7's 10th inning vs. Pittsburgh... Went 3-for-4 with a three-run homer and four RBI to end the first half of the season, July 14 vs. St. Louis … the four RBI tied his career high (also, July 30, 2012 vs. Pittsburgh). Darwin earned a Rawlings Gold Glove Award after he tied the major league single-season record for consecutive errorless games at second base, going 141-straight contests without a fielding miscue from April 18-September 27 ... led major league second basemen with a .997 fielding percentage (2 E/731 TC), and batted .254 (139-for-548) with a career-high seven home runs and 44 RBI in 156 games...Owns all N.L. records for consecutive errorless games at second base, having surpassed Ryne Sandberg's former record 123-game errorless streak - allowing for multiple seasons - that ran from June 21, 1989-May 17, 1990 ... David Eckstein owned the previous N.L. single-season mark of 113-consecutive games set with San Diego in 2010....Played 155 games at second base, making 146 starts ... also saw three games (one start) at shortstop....His 5.18 total chances and 2.2 putouts per 9.0 innings both led major league second basemen ... his 731 total chances at second base ranked third in the N.L....Was the sixth-hardest player to strike out in the N.L., punching out just once every 10.1 plate appearances. ...Produced a .303 batting average (82-for-271) at home compared to a .206 mark (57-for-277) on the road. ...Set career-highs with a .354 slugging percentage and 33 walks. ...Ranked third on the club in hits (139) and runs (73), fourth in doubles (26) and fifth in RBI (44)....Recorded a career-high and team season-high 13-game hitting streak from September 5-18 ... he batted .409 (18-for-44) during the run. ...Batted .290 (40-for-138) in 46 games out of the eighth spot in the order. ...His .284 batting average (25-for-88) in May was the highest of any month. ...Clubbed his first career walk-off home run, May 30 vs. San Diego, a two-run shot off Dale Thayer. ...Recorded a career-high four RBI in a 14-4 Cubs victory vs. Pittsburgh, July 30 ... hit a go-ahead three-run homer off Erik Bedard....Hit a game-tying two-out two-run homer in the ninth inning off St. Louis reliever Jason Motte, September 21 at Wrigley ... Chicago won, 5-4 in 11 innings. ...His 141-game errorless streak ended on September 28 in Arizona, with a throwing error in the eighth inning. In his first full season with the Cubs, Darwin batted .276 (146-for-529) with 66 runs scored, 23 doubles, six triples, twohomers and 43 RBI in 143 games...Ranked first among rookies with 47 multi-hit games, third among rookiesin hits and batting average, tied for third in runs scored and triplesand fourth in on-base percentage (.313)...His 47 multi-hit games were the most by a Cubs rookie since RyneSandberg posted a franchise-record 49 in 1982...it tied for second-mostin franchise annals by a rookie with Ernie Banks, who had 47multi-hit games in 1954...Named the N.L. Rookie of the Month for April after posting a monthly best.326 average (29-for-89) with four walks, 15 runs, four doubles,two triples, one homer and 14 RBI in 25 contests...His 90 hits before the All-Star break rank fourth-most among Cubsrookies...Ken Hubbs had 95 in 1962 and Kosuke Fukudome and GeovanySoto both had 91 knocks before the 2008 Mid-Summer Classic...Ranked second on the club in doubles, third in hits, fourth in runsscored and games played and sixth in RBI...Hit .304 (31-for-102) with none on, none out...went 84-for-307(.274) with no one on base...Batted .297 (35-for-118) with runners in scoring position...Posted a .313 batting average (15-for-48) when batting with a 0-2count, good for second in the National League behind Arizona'sStephen Drew (.318)...Produced a .306 batting average (90-for-294) prior to the All-Starbreak compared to a .238 mark (56-for-235) in the second half...Appeared in 135 games at second base (124 starts) and five games atshortstop (four starts)...hit safely in 87 of his 128 starts...Batted .280 from the two-spot in the lineup, while hitting .293 from theeight spot...Got the Opening Day start at second base, becoming the first Cubsrookie to start the season opener at second base since Manny Trillo in1975 - finished the game vs. Pittsburgh 2-for-4 with a run...Collected a career-high two doubles, April 16 in Colorado...Drove in a run in a career-high five-straight games, April 20-25...Belted his first-career homer, April 25 vs. Colorado, hitting a two-runshot in the first inning off Esmil Rogers...Was on the disabled list, June 14-29, with a left knee sprain...Batted .333 (11-for-33) with one walk, five runs, one double and twoRBI during his career-high eight-game hitting streak, June 11-July 3...that included his first five games back from the D.L. and three gamesprior to his left knee sprain suffered June 13 vs. Milwaukee...Recorded a career-high four-straight multi-hit efforts, July 7-10...Collected a career-high four hits, August 13 at Atlanta...Reached base safely in a career-high 11-straight games, August 13-24. Darwin saw big league action for the first time in his career, posting a .241 batting average (19-for-79) with 12 runs, fourdoubles, six walks and two RBI in 30 games for Chicago. ... Was promoted August 12, making his big league debut that night as adefensive replacement at second base in the ninth inning inSan Francisco. ... Had a .280 average (7-for-25) off right-handed pitchers compared to a.222 mark (12-for-54) off southpaws. ... Batted .308 (16-for-52) in his first 20 games, but hit just .111(3-for-27) in his final 10 contests. ... Batted .406 (13-for-32) in an 11-game span, August 30-September 14. ... Appeared in 10 games (five starts) at second base, 11 games (ninestarts) at shortstop and six games (four starts) at third base.w Started 13 of club's final 25 games -- eight at shortstop, three atthird base and two at second base. ... Made his first career start, August 13 in St. Louis, at second base. ... August 16, recorded his first career hit with a double in the first inning offSan Diego's Kevin Correia. ... Picked up his first career RBI, August 30 vs. Pittsburgh (double in theseventh). ... September 14 in St. Louis, recorded his first major league three-hitgame, going 3-for-4 with a double, RBI and run scored. ... His 143 hits with Iowa led all of Triple-A at the time of his call-up. ... Earned 2010 Pacific Coast League All-Star honors, becoming the firstI-Cubs shortstop to be selected since Ronny Cedeno in 2005. ... Batted .299 (143-for-479) with 24 doubles, four triples, two home runs,72 runs scored, 49 RBI and 11 stolen bases in 114 games for Iowa. Darwin batted .293 (136-for-464) with 24 doubles and 49 RBI in 137 games between Double-A Tennessee and Triple-A Iowa... was named a Southern League Mid-Season All-Star prior to his promotion to Iowa...Hit .317 (80-for-252) with 23 walks, 30 runs, 12 doubles, three homersand 32 RBI in 74 games with Double-A Tennessee...Garnered an impressive .415 average (34-for-82) against left-handedpitching...Went 21-for-55 (.382) when leading off for the Smokies...Produced a .328 mark (42-for-128) at home compared to a .306 average(38-for-124) on the road with Tennessee...Batted .368 (21-for-57) with 28 RBI with runners in scoring position ...boasted a .423 (11-for-26) with 12 RBI with RISP and two outs...Boasted a monthly-best .339 average (21-for-62) in 19 April contests...Posted three-straight multi-hit affairs, May 18-19, going 8-for-12 (.667)with a double and a RBI during the span...After an impressive first half with Tennessee, garnered a promotion toIowa June 30 ... it marked his first action at the Triple-A level...In 63 games with the I-Cubs, posted a .264 mark (56-for-212) with 12doubles, a triple and 17 RBI...Of the 37 games in which he recorded a hit, 18 were multi-hit affairs...Hit .322 (19-for-59) against southpaws compared to a .242 average offright-handed pitchers. Darwin spent the entire season with Single-A Daytona ... batted .262 (107-for-409) with 22 doubles and 51 RBI in 123 games...Tied for the team lead in games played with Jim Adduci and triples (4)with Tony Thomas, while leading the club in sacrifice flies (5)...Hit .298 (57-for-191) with 50 RBI with runners on base ... was 33-for-120 (.275) with 45 RBI with RISP...Tied his career high with an eight-game hitting streak, April 26-May 6,hitting at a .414 clip (12-for-29) with two doubles, four runs scored andsix RBI over the stretch...Owned a .308 batting average (28-for-91) with two doubles, a triple, twoclouts, nine runs scored and 16 RBI in 25 May contests...Had three-straight multi-hit affairs, July 9-11, going 7-for-9 (.778) withthree doubles, including his second multi-double game of the seasonJuly 11...Ended the season riding a seven-game hitting streak and three-straightmulti-hit contests ... was 11-for-18 (.611) with five walks, two doubles,a triple, six runs scored and four RBI...Batted a monthly-best .321 (26-for-81) with a .407 slugging percentageand an .810 OPS in August (26 games). Darwin split the season between Rookie-League Mesa and Single-A Peoria ... combined to bat .289 (56-for-194) with 12doubles, 33 runs scored and 23 RBI in 49 games...Began the season at Mesa, where he batted .444 (8-for-18) with fourwalks, three doubles, six runs scored, two RBI, a .545 on-base percentageand a 1.157 OPS in five games...Reached base six times and collected a career-high five hits July 12 atthe Tempe Angels, going 5-for-5 with a walk, two doubles, three runsscored and a RBI...Spent the remainder of the season with Peoria after being selected fromMesa July 17...Hit .313 (26-for-83) with 20 RBI with runners on base ... boasted a .375average (9-for-24) with RISP and two outs with the Chiefs...Had a career-best eight-game hitting streak August 5-12, going 12-for-33 (.364) with three doubles, one homer, six runs scored and nine RBI. 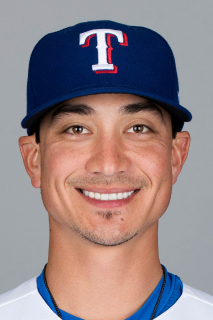 February 5, 2018 Texas Rangers signed free agent 2B Darwin Barney to a minor league contract and invited him to spring training. November 2, 2017 2B Darwin Barney elected free agency. September 3, 2016 Toronto Blue Jays activated 2B Darwin Barney. August 31, 2016 2B Darwin Barney roster status changed by Toronto Blue Jays. December 11, 2015 Toronto Blue Jays signed free agent 2B Darwin Barney. October 22, 2015 2B Darwin Barney elected free agency. October 21, 2015 Toronto Blue Jays sent 2B Darwin Barney outright to Buffalo Bisons. October 19, 2015 Toronto Blue Jays designated 2B Darwin Barney for assignment. October 8, 2015 Toronto Blue Jays reassigned 2B Darwin Barney to the minor leagues. September 13, 2015 Toronto Blue Jays selected the contract of 2B Darwin Barney from Buffalo Bisons. September 13, 2015 Los Angeles Dodgers traded 2B Darwin Barney to Toronto Blue Jays for Player To Be Named Later. September 13, 2015 2B Darwin Barney assigned to Buffalo Bisons. June 14, 2015 Los Angeles Dodgers sent 2B Darwin Barney outright to Oklahoma City Dodgers. June 12, 2015 Los Angeles Dodgers designated 2B Darwin Barney for assignment. June 8, 2015 Oklahoma City Dodgers activated 2B Darwin Barney from the 7-day disabled list. June 3, 2015 Oklahoma City Dodgers placed 2B Darwin Barney on the 7-day disabled list retroactive to June 1, 2015. May 22, 2015 Oklahoma City Dodgers activated 2B Darwin Barney from the 7-day disabled list. May 12, 2015 Oklahoma City Dodgers placed 2B Darwin Barney on the 7-day disabled list. April 14, 2015 Los Angeles Dodgers optioned 2B Darwin Barney to Oklahoma City Dodgers. October 13, 2014 Darwin Barney roster status changed by Los Angeles Dodgers. October 3, 2014 Los Angeles Dodgers reassigned 2B Darwin Barney to the minor leagues. August 10, 2014 Los Angeles Dodgers recalled 2B Darwin Barney from Albuquerque Isotopes. July 30, 2014 Los Angeles Dodgers optioned 2B Darwin Barney to Albuquerque Isotopes. July 28, 2014 Chicago Cubs traded 2B Darwin Barney to Los Angeles Dodgers for Player To Be Named Later. July 22, 2014 Chicago Cubs designated 2B Darwin Barney for assignment. July 11, 2014 Chicago Cubs activated 2B Darwin Barney from the paternity list. July 9, 2014 Chicago Cubs placed 2B Darwin Barney on the paternity list. April 16, 2013 Chicago Cubs activated 2B Darwin Barney from the 15-day disabled list. April 13, 2013 Chicago Cubs sent 2B Darwin Barney on a rehab assignment to Iowa Cubs. April 1, 2013 Chicago Cubs placed 2B Darwin Barney on the 15-day disabled list retroactive to March 31, 2013. Laceration in his left knee. June 29, 2011 Chicago Cubs activated 2B Darwin Barney from the 15-day disabled list. June 25, 2011 sent 2B Darwin Barney on a rehab assignment to Iowa Cubs. August 12, 2010 Chicago Cubs selected the contract of SS Darwin Barney from Iowa Cubs. January 13, 2010 Chicago Cubs invited non-roster SS Darwin Barney to spring training. June 30, 2009 Darwin Barney assigned to Iowa Cubs from Tennessee Smokies.